Monica Gabrielle, who lost her husband, Richard, on Sept. 11, rallied in Washington in June to support creation of a bipartisan commission to study the events surrounding the terror attacks. Activism "is what keeps me sane," she said. NEW YORK -- Monica Gabrielle can't believe what she has turned into. Only a year ago, her most pressing worry was that her husband, Richard, might wrap himself around a tree in one of the car racing lessons he had taken up. She spent most of her free time trying to convince her husband of 28 years that there was no reason to wait for their 30th anniversary to take a big trip to Italy. They were happy. They were settled. Their daughter Nicole was grown. And they were toying with the idea of early retirement. But all that was before Richard Gabrielle, 50, left at 7 a.m. Sept. 11 for his job as an insurance broker at the World Trade Center and never came back. Now, Monica Gabrielle has been transformed from quiet wife and mother into a very active activist. She's doing things -- besides profoundly missing her husband -- she never dreamed she'd do. A year after their loved ones died, the family members have formed a dozen or so Sept. 11 advocacy groups. They've grown accustomed to the spotlight, even if they're still not entirely comfortable in it. They answer reporters' questions. They speak to politicians. Some are even on a first-name basis with New York Mayor Michael Bloomberg. "Last year, the furthest thing from my mind was any kind of lobbying, public speaking, advocating, writing letters to the editor or even seeing a therapist, for that matter," Gabrielle said. Now, "this work is what drives me. This is what gets me up in the morning. This is what keeps me sane." One group of more than 600 family members filed a federal lawsuit last month against officials of Saudi Arabia, banks and charities, charging they financed Osama bin Laden's terrorist network. Some family members have even become celebrities of sorts. Marian Fontana, who lost her firefighter husband, has appeared on CNN and other networks and was the guest of Sen. Hillary Rodham Clinton (D-N.Y.) at the State of the Union address this year. She and others say they have to stay in the public eye so that no one ever forgets what happened. Over the past year, they've waged their struggles in groups as large as Families of September 11th, which boasts 1,200 members and has one office in Washington and plans for another in New York, and as small as September 11th Advocates, made up of a handful of New Jersey widows. Many of these groups have banded together to form the Coalition of 9/11 Family Groups, which is pushing for at least half of the 16-acre World Trade Center site to be turned into a permanent memorial. Steve Push, co-founder of Families of September 11th, said the work of the groups is just getting started. "Unfortunately, Islamic terrorism will be with us for a while, so we're going to be around for a while," said Push, who lost his wife, Lisa Raines, 42, when American Airlines Flight 77 hit the Pentagon. "For all the pomp and circumstance, there's been very little accomplished in the past year when it comes to homeland security." The family members are galled that the U.S. intelligence system failed to prevent the terrorist hijackings. Recently, they pushed House members to engineer a surprise vote in favor of an independent commission to investigate the attacks. The Senate has yet to approve the measure, and the idea is opposed by President Bush. But family members seeking a broader investigation into intelligence failures are far from discouraged. Hundreds of defiant parents, children, siblings and others rallied on Capitol Hill in mid-June to demand an investigation into what the government could have done to prevent the attacks. "My question is what do we know today that we didn't know a year ago that could have prevented Sept. 11?" 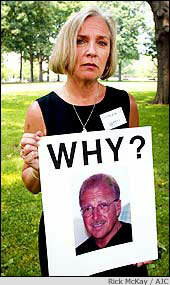 said Lynn Castrianno, whose brother, Leonard, 30, died on the 105th floor of the south tower. In early August, Castrianno, a psychologist in Omaha, Neb., joined other family members in Washington to push for the creation of an independent commission through visits with a dozen or so senators. Castrianno said she surprised herself by not being intimidated when speaking with politicians. "We can't speak their language, because we're not politicians, but we can wear buttons with our loved ones' pictures, which humanizes this issue for them," she said. "A few years ago I would have been in awe, but now I recognize these are just people who have their own agendas and that we have our own agenda as well." Sally Regenhard's agenda includes stricter building codes and a federal investigation into what went awry after the hijacked planes struck the World Trade Center. Regenhard, who lost her firefighter son, has left her job at a nursing home and plunged herself full-time into her new passion: improving skyscraper safety. As founder of the Skyscraper Safety Campaign, she recently got some of what she wanted: New York City officials announced plans for sweeping changes to codes that govern how high-rise buildings are protected against fire and structural damage and how they are evacuated in an emergency. But that's not enough for Regenhard. Finding out whether human error in the design of the World Trade Center contributed to its collapse has become her life's work. Regenhard has read everything she can about the World Trade Center's beams, doors and floor plans. She never hesitates to wave poster-sized photographs of her 28-year-old son, Christian, in the face of politicians whenever she has a chance. In recent months her group has appeared before Congress and embarked on a national speaking tour. "I don't understand why everyone doesn't want to get all the answers," she said. In general, family members say they've had to fight for every answer, which is what has spurred so many to become activists. "We have been met by roadblocks, confidentiality agreements, national security issues and on and on," Gabrielle said. "Last year, I thought my job working for a marketing management consulting firm was stressful," she said. "Today, I realize it was a cakewalk."